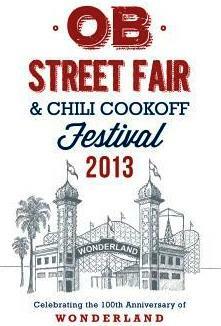 The 34th Annual Ocean Beach Street Fair & Chili Cook-off Festival begins today – Saturday, June 22nd. The Fair offers eclectic fun in the sun that’s great for all ages. Join more than 70,000 visitors throughout the day for tasty festival nosh, art, beachfront entertainment, shopping and more. The chili competition will feature more than two dozen tastings from amateur entrants competing for the titles of Hottest Chili, Judges’ Award and grand prize People’s Choice Award. Attendees of all ages can take part in creating the annual Street Fair mural or playing outdoor laser tag. Artists’ Alley – applications received after May 29, 2013 will be added to the waitlist. There will also be free trolley service to the O.B. Street Fair from Robb Field and Sea World Driver from 9:30 AM to 9:00 PM and running every half hour on the half hour. The Wonderland II – Kids’ Fun Zone will be located in Ocean Beach Park, which is between Santa Monica and Saratoga Ave, just off of Abbott St in Ocean Beach. The Kids Fun Zone will begin at 10:00 AM and go until approximately 7:00 PM on Saturday, June 22nd, 2013. Some of the activities at the Wonderland II Kids’ Fun Zone are planned to include the new Mechanical Shark (like a mechanical bull — but it’s a Great White Shark! ), Surfing Simulator, 27-Foot Cliff Hanger Slide, Dual Lane Giant Slide, challenging 70? Obstacle Course, Bungee Run, Military Bounce House with Slide, Velcro Wall with Sticky Suits, Speed Pitch with Radar Speed Tracking, and for little toddlers, the Animal Kingdom Jungle Playland. According to Greg Knight, owner and operator of San Diego Kids Party Rentals, his company will be pre-selling All-Day and 1-Hour access passes on-line at a 20% savings, priced at $20 and $12, respectively. Cowboy Wordsmith read this on the 92107 Stage with the Cactus Jacks. Got a great reaction. Thanks OB. I Like It!! I Like It! !